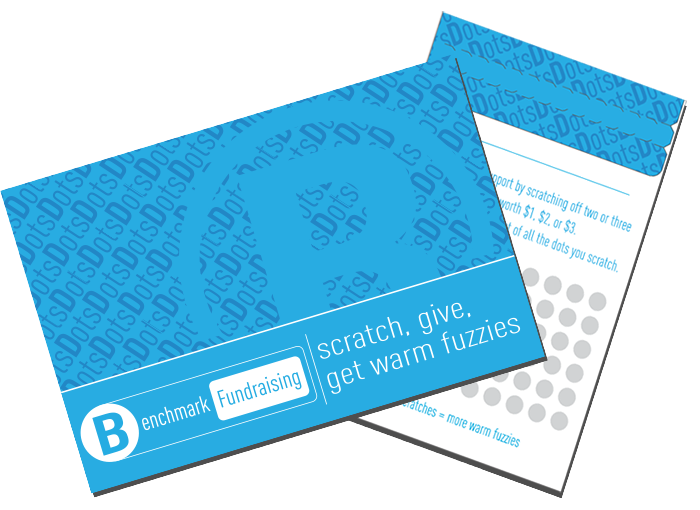 How fundraising with scratch off fundraising envelopes work? Order at least 1 fundraising envelope for each member of your group. Hand out the fancy fundraising scratch-off envelopes to each member of your group. Ask for donations. Instruct each member of your group to get all the dots scratched off their envelope. Each member asks their supporters to scratch off a few dots from the back of their envelope and donate the total amount revealed. Donation amounts behind each dot are $1, $2, or $3.Each envelope raises $150 once all the dots are scratched off. You're done. Supporters donate the total amount that they scratch off. There's nothing to sell or deliver. Zero risk - unless you really don't plan on doing anything, and then you shouldn't be fundraising in the first place. Each envelope WILL raise $150. Envelope dimensions are 6″ x 9″. Our fundraising envelopes do the asking for you. Donation amounts allow everyone to donate as little or as much as they want. "This fundraiser really works! The donation amounts let everybody donate. Some people scratch off one or two dots and some people scratch off a whole bunch. Either way, everybody we asked to donate was able to give a couple of dollars. This really keeps the momentum and excitement up and everybody got their dots scratched off in just a couple of hours." "Hands down the best fundraiser we’ve ever done. It was so much easier than everything we've done in the past and all of our supporters loved it!" How many scratch off dots are on an envelope? There are 60 scratch off dots on each envelope. The dollar amounts under the dots are $1, $2, and $3. They total $150. How many fundraising envelopes should we order? We recommend you order one for each per person that will be helping with the fundraiser. For example, if you are a soccer team that has 40 players, you should order 40 envelopes. You can always order more. Your envelopes will be shipped priority mail through USPS. Typically they take 2-5 days to arrive, depending on where you live. Shipping amounts depend on how many you order. It is typically between $7-$30. We suggest running your fundraiser for 2-4 weeks. Do I need to be part of a group or a non-profit organization to do this Fundraiser? No. Our fundraising envelopes can be used by anyone (group or individual) who needs to raise money! Can we customize the envelopes? We want you to be able to return unused envelopes. For this reason we do not offer envelope customization. Allowing you to return unused envelopes will help maximize your profits. Groups who need to include something specific usually create a flyer that can be handed out to supporters. Orders can be placed on our website or over the phone. If you would like to place your order on our site click here. If you would like to place an order over the phone please call 801-735-4064. What is the minimum number of envelopes I can order? There is no minimum. Order 1, 10, 100, 1,000 or more. The real question you should be asking your self is - how much money do I want to raise?